Imagery refers to a flow of thoughts that you can see, hear, feel smell or taste. Imagery exercises use creative imagination to "picture" situations that heal and relax. This can either be done on your own or with a facilitator, who guides you, as in the case of guided imagery. Studies have shown that the use of guided imagery improves stress levels and are also effective in stress reduction, anxiety management and post-operative healing. For instance, mentally picture yourself in a pleasant place that puts your mind and body at ease. Imagine yourself lying on a beach, listening to the waves. It's very important to imagine a place that has a positive associate for you. One of the most interesting and forgiving features about imagery is that almost anyone can use it. Researchers have suggested that even ten minutes of imagery can reduce blood pressure, lower cholesterol and glucose levels in the blood, heighten short-term immune cell activity and also reduce the aversive effects of depression. 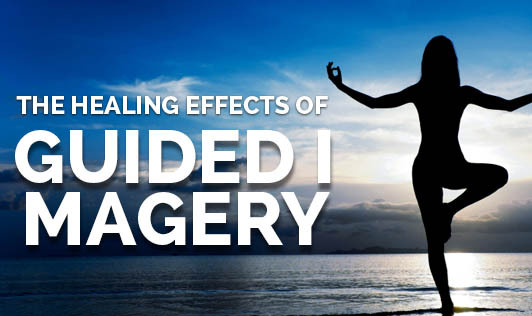 Guided Imagery mobilizes the unconscious and pre-conscious processes to assist with conscious goals and it can bring to bear much more of a person's strength and motivation to accomplish a desired end. Since it is a right-brained activity, engaging in it will be accompanied by other functions that reside in that vicinity such as emotion, sensitivity to music, laughter, openness to spirituality, intuition, abstract thinking and empathy. Now that you know the benefits of guided imagery, would you give it a try?